Clicking Hard Drive Myth | Does your clicking hard drive have bad heads? Myth: A “clicking” hard drive means it has bad heads or is physically broken. It’s reasonable to believe the clicking hard drive myth, in particular, that any “clicking” noises are caused by “bad heads.” It is the heads inside the drive making the clicking noise. However, bad sectors, bad PCB components, corrupt firmware modules, bad power supplies, and other causes can also make the heads “click.” That means: it’s not always the heads themselves that are defective. It’s often other damaged components on the hard drive causing the heads to appear damaged. There are dozens of different sounding clicks which are all caused by various problems and require different solutions. Diagnosing the cause of “clicking” often depends on the hard drive manufacturer and model hard drive. For example, if your Western Digital “WD2500JS” hard drive is clicking, the most likely cause is a bad PCB. Other models (e.g., Seagate 7200.11 drives with SD15 or SD35 firmware versions) may click due to firmware corruption. These are problems which can be fixed by $300 Data Recovery because we have the tools and knowledge required to accurately diagnose and repair these kinds of issues. We recovered 99.98% of the sectors on this Western Digital drive after swapping the heads with one of our donor drives. Cost to customer: $300 total. 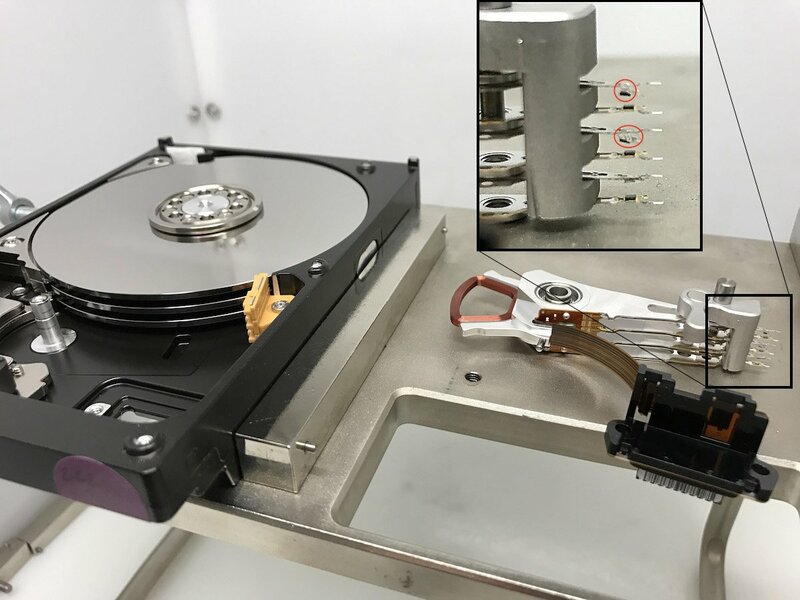 Around 25-30% of the clicking hard drives we receive are caused by a crashed heads or scratched platters. If the clicking is due to damaged heads, we can sometimes replace the heads and provide a full recovery (as seen in the photo above). Head replacements are possible when we already have donor parts in stock, or the parts are not too expensive, and the drive doesn’t appear to have significant platter damage. In cases where the donor parts exceed our flat rate for recovery, we may give you the option of providing or paying for the required donor part (which may cost $100-$250+). If we cannot swap the heads due to the high cost, we offer our customers the option of a partial recovery. For example, if the drive has ten heads and one is bad, we may be able to disable the bad head in the drive’s firmware (safe, non-destructive, non-invasive, and possible for most model hard drives) and recover around 90% of the data.